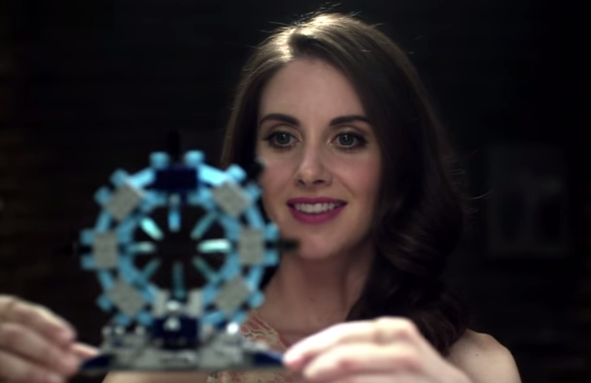 Alison Brie (who voiced Unikitty in 'The LEGO Movie') discovers the power and anguish of putting together LEGOs in this newly released live-action promo with the release of LEGO Dimensions video game only days away. The adorable video features the 'Community' star opening a mysterious box with Unikitty in it along with a portal she has to assemble. It all leads to glee then anger when the last piece goes missing but ultimately once put together a flash of lightning cuts to gameplay. The game will feature characters from across the LEGO multiverse including DC Heroes, Scooby Doo, Harry Potter, Doctor Who, Ghostbusters and many more. LEGO Dimensions will be available on September 27th for PS4, PS3, Xbox 360, Xbox One, and Wii U.